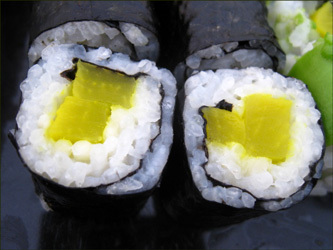 Oshinko (also “Takuan”) is a Japanese pickled radish. 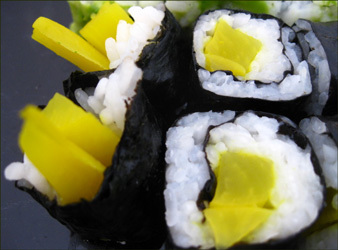 It has a strong flavor, and so can serve as a single filling in a small (hoso) maki roll, or as an addition to other fillings in Foto-maki, or Ura-maki rolls. 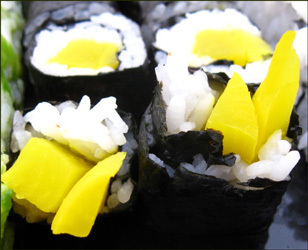 Since pickled, the Oshinko can be stored for long periods in the fridge, even after opening – so it’s a relatively more convenient to handle than most sushi ingredients. Not only for sushi by the way, Oshinko works well in salads and other cold dishes. How does it look like in a roll? Where can I get Oshinko?